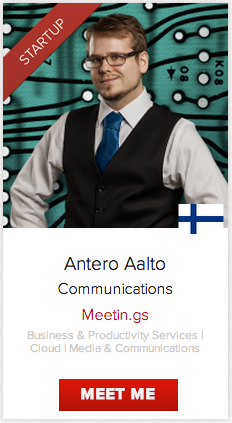 We are extremely excited to announce that Meetin.gs is providing the matchmaking system for one of the best known tech conferences in Europe – Pioneers Festival. This famous tech conference gathers the tech scene from all over the globe to inspire and be inspired. All attendees will be given the possibility to configure their own event related Meet Me pages and share them with other attendees. The whole idea of matchmaking is to bring together visitors with various roles from investors to startup entrepreneurs, offer them an easy way to schedule and set up a meeting together. 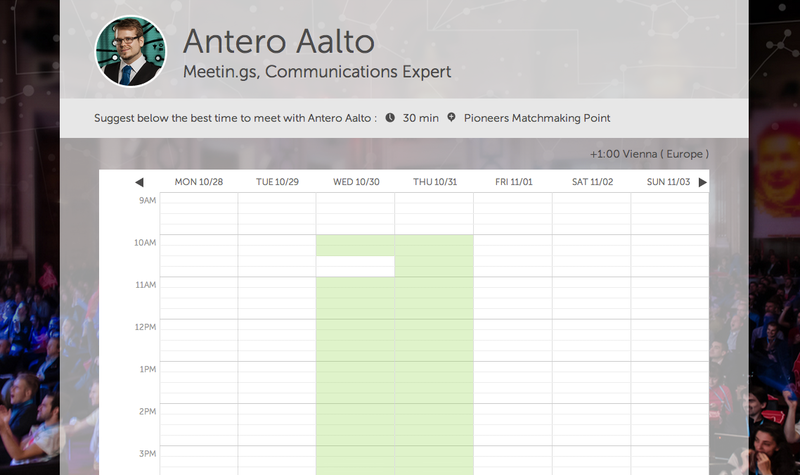 In addition to amazingly easy scheduling, we provide the normal functionalities of Meetin.gs to the attendees. This will allow them to have an online meeting page and mobile apps for communicating and sharing meeting related information and materials before, during and after the event. We believe that this kind of interaction will increase the benefits gained from the face-to-face meeting, as both parties will be better prepared. At Pioneers Festival, the actual meetings will take place in a designated matchmaking area with the necessary amenities for holding pleasant meetings. We saw the matchmaking as a natural continuum in the development of our product, as it uses many of the same features as our normal Meet Me pages and related scheduling functionality. Our matchmaking engine was first taken on a test drive at Arctic15 and Slush conference, few of the largest startup events in the Nordics. We received a lot of invaluable feedback from those events. Based on that feedback we did some very dramatic improvements and fixes to perfectly match the needs of even the larger events. 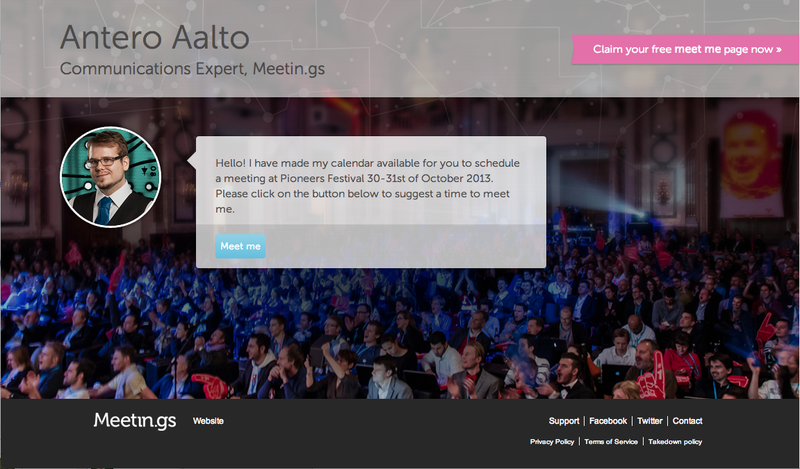 Are you organizing an event and want to offer your guests a top-notch tool for in-event-meetings?